Posted by Ada Wang on 11/30/2018 10:22:46 AM. How to open DRM protected PDF files when you copy or transfer PDF to other device? If you break DRM protection on PDF files in unreasonable way, it will be a thorny issue. This tutorial will introduce an effective and practical solution to remove DRM from PDF (ACSM) with All DRM Removal. 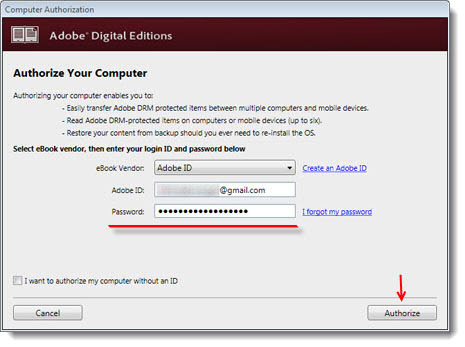 If you install Adobe Digital Editions 3.0 and open it for the first time, it will remind you to input your login information for Adobe ID. Adobe’s DRM works by associating each ebook with your Adobe ID. Make sure DRM PDF files can be read on ADE for windows/mac. Create an Adobe ID here. If you want to deauthorize your computer, just press “CTRL”+ ”SHIFT” + “D” key at the same time. And click “Erase Authorization” button in the bottom of pop-up window. Restarting Adobe Editions will ask you to reauthorize your computer. Selecting the menu “help” > “Authorize Computer” and login it again. If you download PDF eBooks before authorizing your computer or device, or the book was downloaded with a different Adobe ID, you won't be able to read this book. The error is related to Adobe’s DRM below. To fix the error “E_LIC_ALREADY_FULFILLED_BY_ANOTHER_USER”, go forward to Adobe Digital Editions Discussion. Install Epubor All DRM Removal and re-download DRM PDF eBooks after authorizing your computer. In this article, I will teach you how to remove DRM from PDF files by downloading free sample PDF eBook from ADE. When you download “The Princess Diaries” PDF eBook from ADE, you will find the PDF eBook is ACSM files. Double click the .ACSM file or select "Open with" -> "Adobe Digital Editions 3.0". Then we press “CTRL”+”I” key simultaneously or navigate to "File" Menu > "Item Info" > "Location". Click arrow icon next to the location. 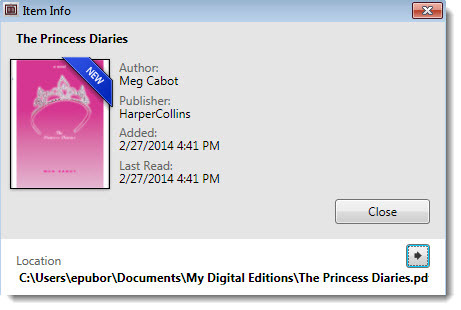 It will show us the DRM PDF file “The Princess Diaries” in explorer. When you already find the PDF eBook, now we can load into the other device such as KoBo Reader, Sony Reader etc. It can be open with Adobe Reader authorized with the same Adobe account. Othewise it will pop up alert window without any results. It's a disgusting reading experience when it’s transferred or copied to other device. So we have to remove drm protection from pdf ebooks. Run All DRM Removal and Load DRMed PDF into it. Click “add” button and it will pop up a window to add files. We copy the “The Princess Diaries” PDF file path which is name of “Location” above. Or drag books into main window, no need to click any button. When the PDF eBook is imported into Epubor software successfully, now just click “Remove DRM” button. Then the software will decrypt it automatically. Open we newly created DRM-free PDF. Now you can read “The Princess Diaries” PDF eBooks on android tablet etc without authorizing any device free. To enhance a reading experience, you can also convert DRM PDF to EPUB or Kindle format by your choice. Books purchased from these stores are Adobe DRM protected: Sony, Kobo, Nook(part of), Google Play, Lulu, FictionWise etc. By the way, All DRM Removal can remove drm from all eBooks except for iBooks. A tool called Requiem to remove DRM from iTunes PDF iBooks. For Nook protected books, you can also use All DRM Removal to Remove Nook DRM. Learn how to remove Adobe DRM on PDF books free. I downloaded your trial version. I have a PDF publication blocked with a DRM protetion because it was download and opened by my secretary on her PC before understanding it was protected with this new method. I run your program on the dir. No success. You copy her PDF to your ..\My Digital Editions folder! That's the problem, It's her PDF documents, you must use here ADE account to decrypt the PDF. You can install PDF DRM Removal on here PC, after decrypt the PDFs, then copy PDF to your PC. Wow, that quick. Nice tool, did the job. I've read quite a bit of information on this topic and felt confused. You're the only writer that has helped make it sensible. Thank you.